Most people use the photo seller plugin to sell their photos. However, you may want to give the photos of a gallery for free. Photo seller plugin has a feature that lets you do this. There are two ways you can offer free photo downloads from your site. I will explain both the methods below (pick the one that suits you best). When this feature is enabled in a gallery, your visitors can browse the photos from that gallery and then download the photos for free. Edit the gallery in question, then check the “Enable Instant Download” field. Save the gallery. Your visitors will see a download button when they go to view the details of the photo. 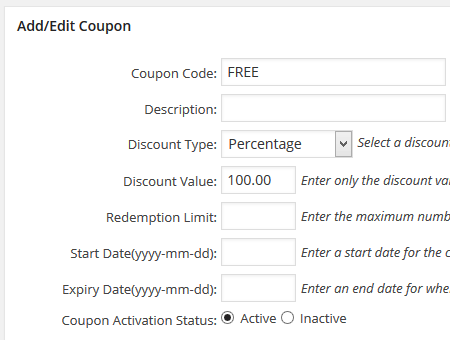 Setup a %100 discount coupon in the plugin then share this coupon with your users. When the user goes to checkout, if the total cost is $0, the photo seller will automatically invoke the manual checkout. After filling in the manual checkout form, the plugin will send the (free) download links.